Washington - One of three college students arrested Wednesday in the Boston Marathon bombings case was allowed to return to the United States from Kazakhstan in January despite not having a valid student visa, a federal law enforcement official told The Associated Press. Authorities charged the student — a friend and classmate of one of the men accused of setting off the deadly explosions — with helping after the attacks to remove a laptop and backpack from the bombing suspect’s dormitory room before the FBI searched it. The government acknowledged that U.S. Customs and Border Protection was unaware that the student was no longer in school when he was let back into the United States. The disclosure was another instance of possible lapses by the federal government in the months before the Boston bombings. The Obama administration earlier this week announced an internal review of how U.S. intelligence agencies shared sensitive information and whether the government could have disrupted the attack. Republicans in Congress have promised oversight hearings starting next week. Federal authorities on Wednesday arrested three college friends of Dzhokhar Tsarnaev, a bombing suspect, including Azamat Tazhayakov, a friend and classmate of Tsarnaev’s at the University of Massachusetts Dartmouth. Tazhayakov left the U.S. in December and returned Jan. 20. But in early January, his student-visa status was terminated because he was academically dismissed from the university, the official told the AP. The law enforcement official said information about Tazhayakov’s status was in the Homeland Security Department’s Student and Exchange Visitor Information System, called SEVIS, when Tazhayakov arrived in New York in January. The official spoke on the condition of anonymity because this person was not authorized to discuss details of Tazhayakov’s immigration history. DHS spokesman Peter Boogaard said when Tazhayakov arrived on Jan. 20, Customs and Border Protection officials had not been notified that he was no longer a student. Boogaard said in an emailed statement that DHS had recently reformed the student visa system to ensure that CBP would have access to all relevant student visa information. Later, however, he clarified the statement to say that the reform was ongoing. “At the time of re-entry there was no derogatory information that suggested this individual posed a national security or public safety threat,” he said. Tazhayakov and another student from Kazakhstan, Dias Kadyrbayev, were detained last month on immigration charges. They were arrested on federal criminal charges of conspiracy to obstruct justice. Robel Phillipos, 19, was also arrested and charged with willfully making materially false statements to federal law enforcement officials during a terrorism investigation. Questions about Tazhayakov’s immigration status came up Wednesday during an immigration hearing in Boston when a judge questioned how he was able to return to the U.S. in January. A lawyer for Tazhayakov said he had re-enrolled in the university with a different major after returning to the country. International students who aren’t enrolled or are dismissed from a college or university generally have 30 days to rectify their status and re-enroll as long as they are already in the United States. 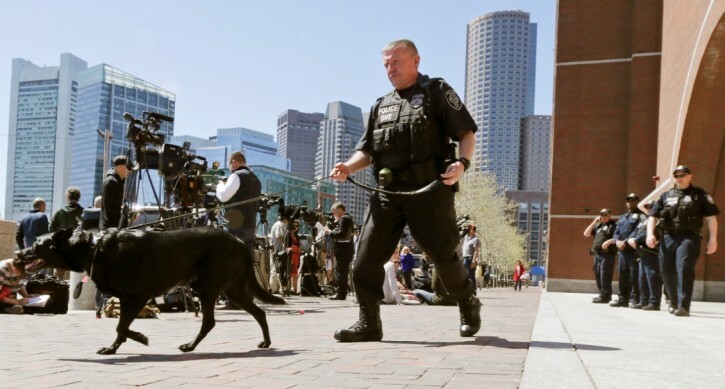 Lawmakers have questioned information sharing among U.S. law enforcement before the bombings. In 2011, Russian officials notified the FBI and CIA that they were concerned about now-deceased bombing suspect Tamerlan Tsarnaev. In early 2012 Homeland security was alerted of Tamerlan Tsarnaev’s travel to and from Russia — information that was shared with Boston’s joint terrorism task force. But the FBI investigation into him had closed and therefore he didn’t warrant additional scrutiny, officials have said. so what else in new? How was he allowed in? Why do they examine my elderly mother's papers with a microscope when she comes to visit but these muslim "students" have no problem getting in every time without visas? Even if most of them are harmless, obviously there is a problem when one isn't. How would we know?